It took two years but she's finally figured out how to watch a video! 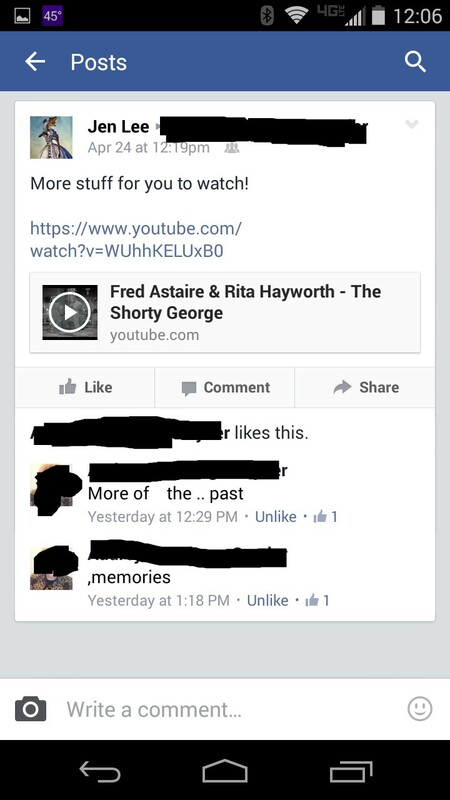 I'm looking for youtube videos of people dancing all fancy to share with my grandma. 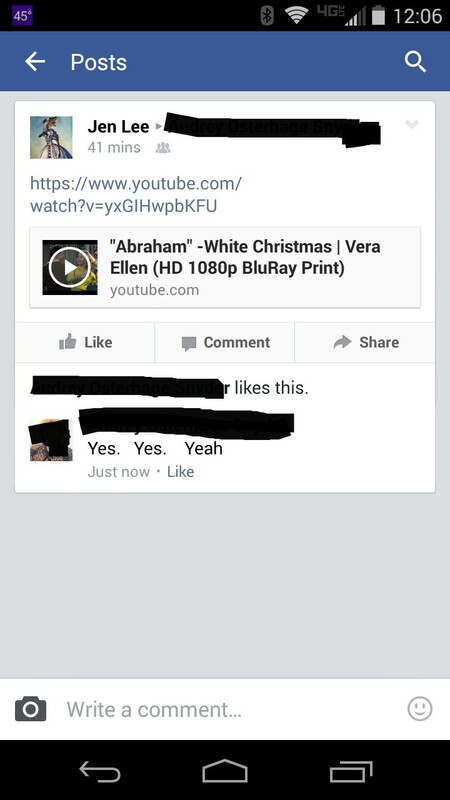 Just in the last few weeks it appears that my grandma has finally learned how to watch a video on her tablet...as long as it's a youtube video and shared through facebook posted directly on her wall. I can work with that! But now I need things to send her. Yesterday I sent her this video, which I only happened across because of this thread. Huge, huge hit. Gram danced competitively when she was young and eats this stuff up. Problem is, this is a huge cultural blind spot for me and I can't watch Fred Astaire talking for more than about 4 seconds before wanting to claw my own eyeballs out and even so I have no way to evaluate what dance stuff is cool, aside from the very very very obvious stuff like that Nicholas Brothers video. Most of it is supremely boring to me. I don't even know what famous dancer people names to search. There's tons of material on youtube but I can't myself tell which are worth watching & sending, and I'd prefer to only send Gram things that are The Best. Thanks! I'd like to build up a little cache so I can send her one every day. Anything from Singing in the Rain. Give me a few minutes and I should have more. - Fred Astaire and Rita Hayworth - "the Shorty George"
Look on YouTube for Bob Fosse. So many, many marvelous videos there. Another good YouTube search is "Sammy Davis Jr. dance." Honestly, those three people probably have enough links to keep you going for a year. Gene Kelly is amazing, I like him better than Fred Astaire. I couldn't find a playlist to link to, but YouTube has a ton of stuff. Also, ha ha, jinx, ChuraChura! My go-to is the Nicholas brothers. They always seem to be having so much damn fun. Did you watch them do I've Got a Gal in Kalamazoo? Because they sing in it, too. White Christmas has some flashy dance numbers-- I like "Abraham." One of the great things about grandparents who aren't super-conversant with the Internet, though, is the ability to magically bring forth things they assume are unfindable. Ask her if there's a movie, dancer, song, whatever that she remembers fondly, and bask in her astonishment when the thing appears. A thing she's thinking of is probably even better than a thing that's The Best, and you can fill in with more general things. Ask her if there's a movie, dancer, song, whatever that she remembers fondly, and bask in her astonishment when the thing appears. Sing Before Breakfast, with his sister Vilma Ebsen, then joined by Eleanor Powell to finish the number. Ebsen and his sister Vilma were known as "The Baby Astaires." From 1929, The Gold Diggers of Broadway, a big musical number that starts heating up around the 2:00 minute mark, complete with back flips and ballerinas. In Technicolor! This video of the Nicholas Brothers in Stormy Weather has some pretty amazing dancing. Tip o'the tap shoes to Peregrine Pickle for the link. These might tickle her: Fred Astaire making a dance partner out of a piano in "Let's Dance" and E. E. Horton doing a bizarre knee dance with spacesuited Betty Grable in "The Gay Divorcee." Any chance you could use dance clips to tease her into using youtube on her own? The "astonishment when the beloved thing appears" effect is the only thing that's given my 84-year-old dad the curiosity to explore any part of the internet. Also, if she's not quite up to exploring youtube without guidance, a fun middle ground might be for you to create a youtube playlist, which is super easy and generates a shareable link that takes one straight to that list of content (which I think even auto-plays in sequence). This might be easier for you both than posing individual links to her facebook wall (but whatever works!). Good luck and I hope you both have lots of fun digging up gems. One more: if she is a fan of George and Gracie, this is a great video of Gracie Allen with Eleanor Powell. We forget that Gracie was also a hoofer, but she gives it up to Eleanor, who does amazing things with a jump rope. Thanks, guys! She seems to be enjoying things so far. Look for Shirley Temple tap dancing. Also Busby Berkeley. He's the guy that did all those HUGE stage-full of synchronized routines with hundreds of dancers. Also Esther Williams synchronized swimming dances.